1. Find a cute dress that could pass for something your grandmother would wear. 2. Get a neutral colored baby beanie that you don't mind gluing. 3. Find some fake pearls from any art supply store. 5. Get cheap baby sunglasses and remove the frames. 6. Use glue to attach fake glasses holster chain. Lilly loved her outfit and was actually very comfortable in it. 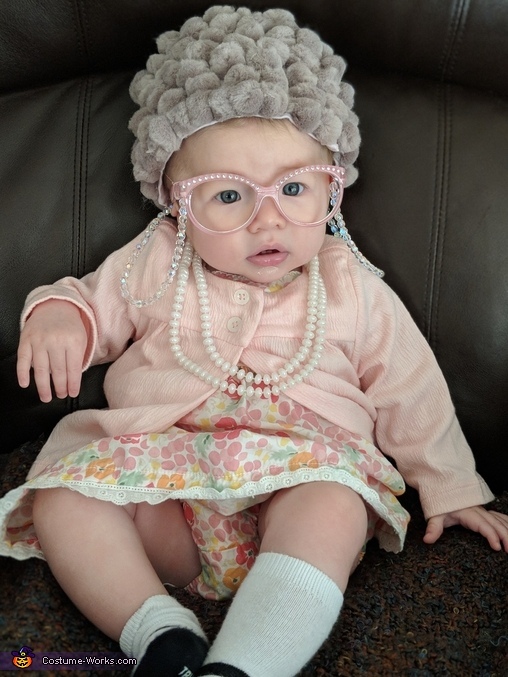 She is only 6 months old and loves to grab and move things but if done right, this costume is very low maintenance and comfortable for the baby involved.